The turkey (Meleagris gallopavo) is a bird species originally from North America. Specimens that still live freely in the wild are called wild turkeys, while domesticated birds are called domesticated turkeys or simply turkeys, but both are the same species. Turkey eggs are rich in protein, iron, folic acid and vitamin B12 and are one of the most nutritious egg varieties, in some respects better than chicken and quail. Indeed, they have a much higher fat and cholesterol content, but moderate consumption should only provide benefits and no side effects, unless there are any pre-existing medical conditions that restrict the consumption of turkey eggs. What do turkey eggs look like? Turkey eggs from a mature hen are only slightly bigger than duck eggs. For example, one duck egg weighs about 70 g, while one turkey egg weighs about 79 g. A turkey hen who has just begun laying will produce smaller eggs, the size of duck eggs or slightly smaller. The eggs have a typical ovoid shape, only slightly pointier at one end and their shell is speckled with brown, this being the most distinctive characteristic of turkey eggs. What do turkey eggs taste like? Turkey eggs taste almost identical to chicken eggs and you almost can’t tell the difference between the two unless you know beforehand what egg variety you are eating. Unlike duck eggs which taste fattier because they have more yolk compared to chicken eggs, turkey eggs are more balanced, hence their taste. The shell as well as the membrane between the shell and the egg are also slightly tougher than that of chicken eggs. It is also common for turkey hens to lay eggs with two yolks. 1) High in cholesterol. 100 g of turkey egg has 933 mg of cholesterol, while 1 egg has 737 mg of cholesterol. In other words, a single turkey egg has as much cholesterol as two large chicken eggs and more cholesterol than 9 quail eggs. Also, 100 g of turkey egg has more cholesterol than duck and goose eggs (see Benefits of Duck Eggs). Believe it or not, cholesterol is actually an essential nutrient. It helps synthesize vitamin D for a strong immune system, hormones for fertility, bile acids for digestion and protects nerve cells from demyelination, contributing to a lower risk of degenerative diseases of the nervous system. Cholesterol alone is not unhealthy and research shows dietary cholesterol does not have such a big impact in blood cholesterol levels as previously thought (so it’s not true eating eggs raises blood cholesterol levels in healthy individuals). But since cholesterol is found with other fats and those fats are more likely to negatively impact cardiovascular health, it is recommended to either avoid high-cholesterol foods or eat them infrequently and in small amounts if you are already suffering from high blood cholesterol levels, heart disease, obesity or diabetes (see article Cholesterol: Good or Bad for You). 2) Rich in fat and calories. A single turkey egg has almost as many calories as two chicken eggs and almost just as much fat. So if you eat too many, you risk weight gain and complications if you are already suffering from diabetes or cardiovascular disease. But eating turkey eggs infrequently and in moderate amounts could provide benefits such as constipation relief, steadier blood sugar levels because of the fats (and protein) in the eggs, feeling satiated for longer, more energy as well as benefits for memory, learning and clearer thinking. 3) High in protein. Turkey eggs have more protein than chicken, quail and duck eggs and almost as much as goose eggs. 100 g of turkey egg has 13.68 g of protein, with 1 egg (79 g) having 10.81 g of protein. The best part is egg protein is quality protein, containing all essential amino acids the body needs to keep us healthy, but cannot synthesize by itself. Eating turkey and eggs in general helps build muscle mass, encourage weight loss, combats brain fog, mood swings, supports learning, memory and other cognitive functions. Moreover, amino acids help synthesize neurotransmitters in the brain that regulate sleep, appetite and mood. 4) More vitamin B12 than chicken and quail eggs, but less than duck and goose. 100 g of turkey eggs provides 1.69 mcg of vitamin B12 compared to chicken eggs which have 0.89 mcg of vitamin B12 per 100 g or quail eggs, 1.58 mcg. Vitamin B12 is vital for the production of red blood cells and providing energy to muscles, combats fatigue, restores vitality, is good for pregnant women because it helps with the normal growth and development of the baby in the womb and plays an important role in preventing degenerative diseases of the nervous system such as multiple sclerosis. 5) Good source of folic acid for pregnant women. One turkey egg provides 56 mcg or approximately 14% of the recommended daily intake of folic acid for an average adult. This makes them a good food for pregnant women, helping prevent neural tube defects of the spine, spinal cord and brain in newborn babies. Folic acid together with vitamin B12 in turkey eggs are good for both baby and mother. 6) Good source of vitamin A. 100 g of turkey egg has 166 mcg of vitamin A out of the 900 mcg RDI (roughly 18% of recommended value). Vitamin A has anti-aging benefits for skin, promotes visual acuity and good eyesight and helps maintain the health of mucous lining across the human body, contributing to better immunity. 7) Rich in iron. 100 g of turkey eggs has 4.1 mg of iron, about 23% of the RDI (18 mg). Iron oxygenates muscle tissue, supports good respiration and has an energizing, revitalizing effect. It supports learning and boosts immunity. Other notable vitamins and minerals in turkey eggs include: vitamin B1 (0.110 mg), vitamin B2 (0.470 mg), vitamin B3 (0.024 mg), vitamin B6 (0.131 mg), calcium (99 mg), magnesium (13 mg), phosphorus (170 mg), potassium (142 mg), sodium (151 mg) and zinc (1.58 mg). 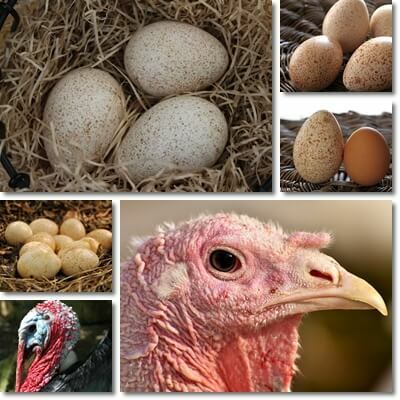 Turkey eggs also contain selenium, Omega-e fatty acids and choline for thyroid, cardiovascular and brain health. 8) Good for skin and hair. Lastly, eating turkey eggs is good for hair because the amino acids making up protein, B vitamins and fats help nourish and strengthen hair (see article on Nutrients for Healthy Hair). Vitamin A has an anti-aging effect on the skin, zinc combats acne, while the monounsaturated, polyunsaturated and other fats in the egg yolk help skin cells better retain moisture, contributing to hydrated, better-looking skin. Conclusion. Turkey eggs don’t happen to be the most popular egg variety, despite being more nutritious than chicken eggs in certain aspects. Although they have a higher energetic value and overall more fat and cholesterol, they are also a better source of protein and several essential vitamins and minerals, especially folic acid, vitamin B12 and iron. Eating turkey eggs provides benefits for skin, hair, eyesight, boosts immunity and energy levels, combats fatigue, brain fog and mood swings and nourishes the brain for better memory and learning. The only thing to remember is that they are best consumed in moderation, preferably not every day and always cooked well.